Is it possible for this analysis to be completed on a known CGI drone? I would like to see a comparison. Maybe Kris or Lev could supply one of their creations. Thank you. Here's another (bigger) version, but as wires are only present in Raj's image the above version is probably better for comparison. Here's the analysis of Jtp on OMF about Raj's pictures, including the full process for create such a Fourier transform with Image Analyzer, that I also use. I've been examining some of the drone photographs with software called Image Analyzer by MeeSoft, freely available at http://meesoft.logicnet.dk. What makes this program so special is that it can perform a so called Fourier transform on an image. That means it can break down a picture to its frequency components and then display it in such a way that might expose some "hidden" information in the picture. The whole process is rather hard to explain, but a good introduction can be found at http://www.cs.unm.edu/~brayer/vision/fourier.html. The Fourier transform is especially useful in analyzing the motion blur which some of the drone photographs exhibit due to apparent camera shake. If we assume that the drone was created with CGI and then composited into a real photograph, it would mean that the motion blur on the drone was also applied as a post-process. Now, if one could prove that the drone was blurred differently from its surroundings, it would be good evidence against the authenticity of the photos. The leftmost image is a 256 x 256 detail from the most blurred photo taken by Raj (http://tinypic.com/view.php?pic=4zass3l). It was converted to grayscale, because the Fourier transform works only on one color channel. The middle image is processed with the Highpass filter (with filter strength of 1.0). This removes the lowest frequencies from the image, allowing us to concentrate better on the motion blur, which was unaffected by this operation. The rightmost image shows the Fourier transform of the middle image (displayed with "Square root" mapping method - one has to choose this from the menu "Map -> Complex representation...") The fuzzy, oval-shaped halo surrounding the center of the image is the "fingerprint" of the motion blur found in the photograph, and it should remain the same no matter which section of the photograph we are examining. The sharp spokes radiating from the center are an artifact caused by a number of straight lines in the detail image (the wires and the pole). Here's another detail from the same photograph. Note that the oval-shaped halo has exactly the same shape as in the previous image. The angle of the halo also shows us the direction of the motion blur; it is always perpendicular to it. Finally, here's a detail of the actual drone. Although the spokes look slightly different, the halo has still a remarkably similar appearance to the previous two images. This means that the motion blur on the drone has the same properties as the motion blur elsewhere in the photograph. For comparison, above is the drone from the sharpest photo by Raj (http://i14.tinypic.com/6gjyo0n.jpg). Notice that the Fourier transform looks very different now. The previously fuzzy oval is now shaped like a circle, and it fills almost the whole image. This is how a well-focused picture should look like in Fourier space. Above is the same detail from the drone as in the previous image. In addition, I've applied a motion blur to it in Photoshop with angle of -80Ã‚Â° and distance of 6 pixels. However, the Fourier transform doesn't look similar at all to the original images; it looks rather artificial instead. Here's another try with the same motion blur, but with added noise (Amount 1%, Gaussian distribution) and added degradation from JPEG compression. The leftmost image is convincing enough to fool at least my eye, but the Fourier transform still shows without a doubt that the motion blur is not the same as in the original photograph. Now, it's starting to look like that it would be fairly tricky to create a motion blur effect that would be a perfect match, at least using standard tools such as Photoshop. It might be possible, but it would require plenty of trial and error. Perhaps the hoaxer used a special program to do this, or perhaps he composited the drone into an unblurred image, printed it out and then took a shaky photo of it. The latter sounds more plausible, as it would automatically guarantee that there would be no apparent inconsistencies in the image. However, even that might be possible to detect with some careful analysis. I'm currently working on a comparison of the Fourier Transform between a 256*256 square of Raj's blurred image and a 256*256 square of the actual known fakes, using the same method as Jtp, with Image Analyzer. Neki: In your comparison, don't you need to convert your pictures in grayscale before proceed with your FFT algorithm?? Eleventh ! Congratulations on producing a top quality professional grade deep analysis of a very important aspect that is very telling. It was a fascinating read as well ! Thanks, Tomi, but even if I know how to use tools for the Fourier transform, it's Jtp that you must thanks!! Sometimes, it's good to refresh memory to people who have definite answers..... If you see what I mean! I didn't know about this previously, but it turns out that you can actually edit FFT data to fit your needs, and then simply reverse it back with iFFT and mix it with color information to get a new image - with whatever FFT characteristics you want it to have! 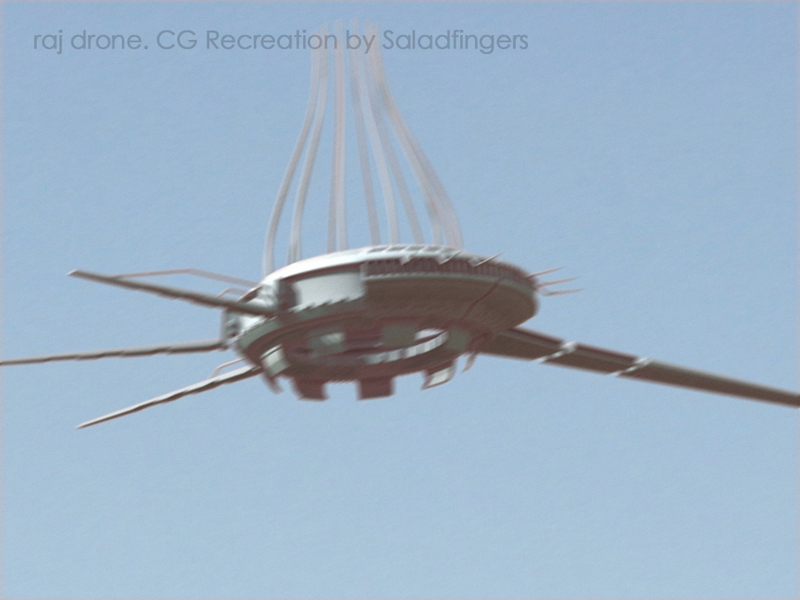 Here's a first try with a Saladfinger creation including motion blur. I took a 256*256 square of the original image (1), convert it to Grayscale (2), then apply a highpass filter in both directions, with a filter size of 1.00 (3), and apply the Fourier transform with a square root mapping method (4). The result is very close to (2), then Jtp was right when he was saying: "that it would be fairly tricky to create a motion blur effect that would be a perfect match, at least using standard tools such as Photoshop. It might be possible, but it would require plenty of trial and error"
I will try later with other blurred fakes drones pictures the same process, see if we can define a line to detect fakes this way. 1- we can probably detect this way fakes motion blur images (however, need lots of tries and verifications to confirm it definitly); UNLESS the faker have a special software able to create an indetectable artificial blur. 2- Raj's blurred picture has not been post-proceded to create artificial blur; UNLESS the faker took a shaky photo of a composited-drone into an unblurred image.